I called Fall busy after finding "42 caches in 5 states and one foreign country," so I guess I'll call Winter busy after finding 35 caches in four states. And I'll call in 2018, even though two of those caches were found at the end of 2017. On New Year's Eve, I found caches in Manassas and Manassas Park, where were Counties (county equivalents) 53 and 54. That also earned me the "Last Cache of 2017" souvenir (Souvenir 39). I finished up 2017 with 80 caches found, which is second only to 2016's 134. So of course, 2018 opened up the next day with the "First Cache of 2018" souvenir (Souvenir 40). January's trip to San Diego enabled me to nab seven caches, including my first from December 2013 (Month 155), August 2008 (Month 156) and November 2005 (Month 157). 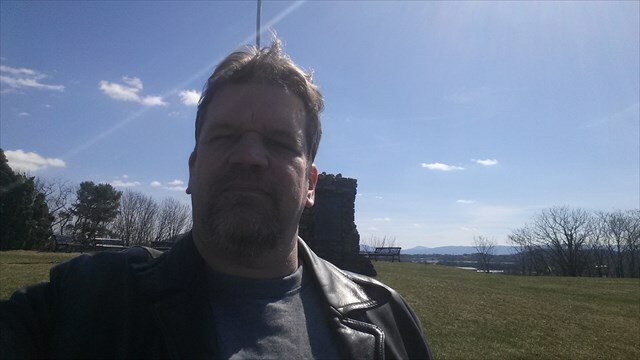 Back in Virginia, I found 3 more, including a challenge cache that was my first difficulty/terrain combo 4/5 (Combo 30) and one from December 2013 (Month 158). 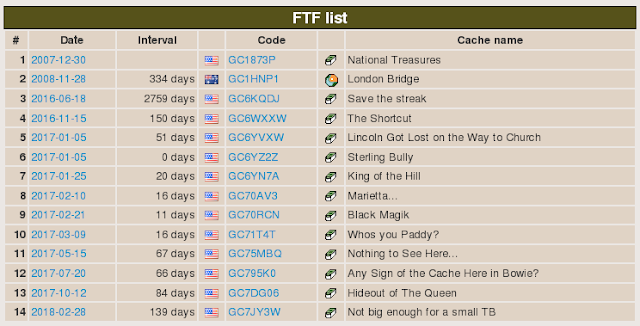 It required finding caches in 10 countries, not including Puerto Rico. My December trip to Hong Kong let me claim this one. February saw another trip to California, with only two caches found. The first was a 5/2 D/T challenge (Combo 31) from March 2014 (Month 159). That completes the year 2014 for me, joining 2002 and 2016. Here the challenge was to find caches at all distances from home listed on the web site (e.g., one less than a mile from home, one 1-10 miles from home, etc.) 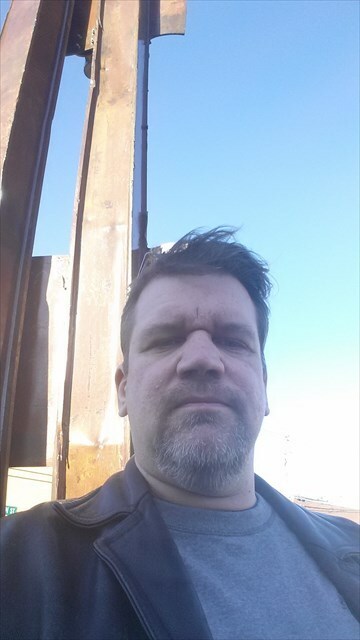 The cache owner sent me a message expressing surprise that I had met the challenge with so few total caches. The second was an oldie, from March 2001 (Month 160). It was the third-oldest cache I found. I then found a virtual at Mount Vernon from October 2001 (Month 161). It was the eight-oldest cache I have found. After that, the next cache I found was right near work. I was getting in my car to go home when I got the alert, so I knew I would get the First-to-Find (FTF). Unfortunately, there was a little drama there, since I accidentally signed the bottom of the log, and others did not notice and claimed FTF after signing the top of the log. Fortunately, it was all straightened out, and I had FTF #14. That also gave me February 2018 (Month 162). 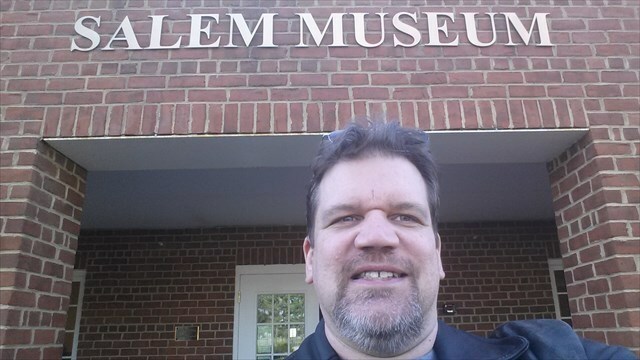 I found another one in Maryland from November 2017 (Month 163) and one in Virginia (no milestones achieved) before heading out on my most epic day of caching yet. Yep. Eleven caches in a day. Many cachers do hundreds, or even a thousand (somehow), but this was my record. Further, I did it on a road trip to Tennessee, allowing me to pick up 10 new counties (Counties 55-64). (I found two in Salem, Virginia.) On that day, I found caches from February 2009 (Month 164), August 2007 (Month 165), May 2010 (Month 166) and January 2009 (Month 167). In planning the trip, I used an on-line tool that allowed me to find caches from unfound months. Here are some pictures from logs on that day's caches. The next-to-last cache of the day was an interesting case. It had gotten dark, but sometimes it's possible to grab a quick cache at a rest stop. I stopped at the Tennessee Welcome Center, and there were a few. I opted for one on the northern edge of the welcome center. Surprise! 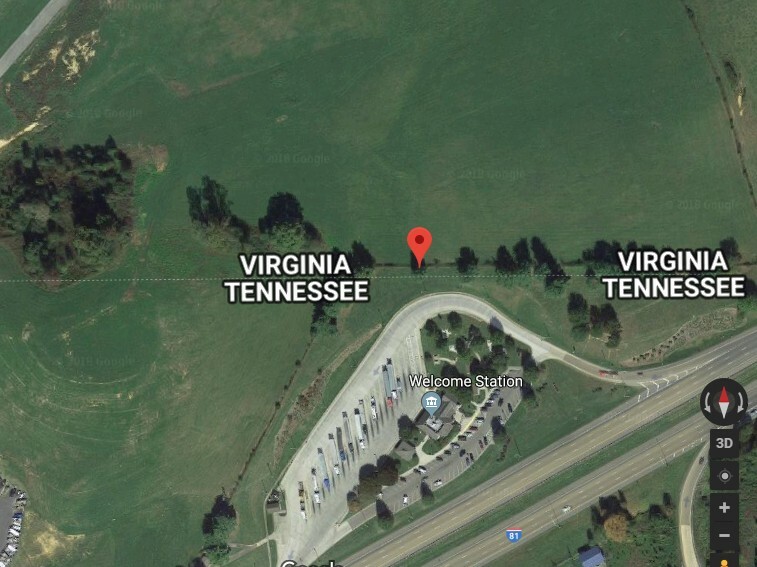 The northern few feet of the Tennessee Welcome Center appear to be in Virginia, so this counted as my first cache in Washington County, Virginia. On the drive back, I found caches in Bristol (County 65), Washington County (turned out to be my second one, but I did not know it yet), and Pulaski County (County 66). Now at 21 Virginia counties! Back in Maryland, I found two more, including one I was second-to-find on in March 2018 (Month 168). 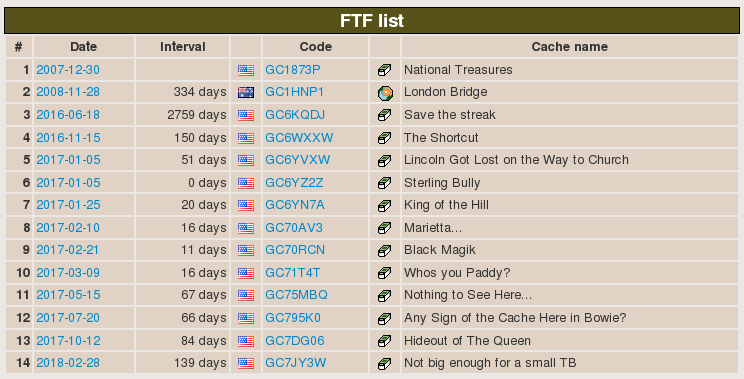 Only missing 47 months makes me feel like I'm closing in on this challenge, although I'm sure the fact that 10 of them are from the first 14 months of geocaching will make things quite difficult.